After their humble beginnings as one of 7 tribes that left Aztlan (said to be far away up in NW Mexico, and to this day never found) in 1168 CE, and their wanderings through the country for the next 150 odd years, the Aztecs finally settled in Lake Texcoco in the Basin of Mexico in 1325. For the next 100 or so years they fought their way up to be the leading tribe around the crowded lake area, and in the next 100 years the Aztecs took off: after forming a Triple Alliance with two other powerful city-states Tezcoco and Tlacopan, they built an empire that grew quickly. By the time of the Spanish invasion, ‘the greatest military empire the Western Hemisphere has ever known’ controlled most of northern Mesoamerica: over 400 city-states (some 5 million people), covering most of today’s central and southern Mexico, and extending down to Guatemala, an area of over 77,000 square miles. 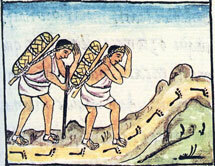 What we call a ‘city-state’ was called in Nahuatl altepetl. 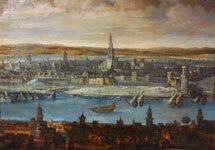 At its centre was a town with a government, a society of commoners, and land. Put simply, they either raided or traded with each other, the losers paying the victors. The main goal of the Triple Alliance was to dominate as many city-states as possible, forcing them to pay tribute 4 times a year. The Aztecs strongly believed they were on a mission to take over the known world, given them by their tribal god Huitzilopochtli on their journey south from Aztlan. The capital city of the Aztecs, Tenochtitlan (‘Place of the Prickly-pear Cactus on a Rock’), was believed by its inhabitants to be the centre of the universe. 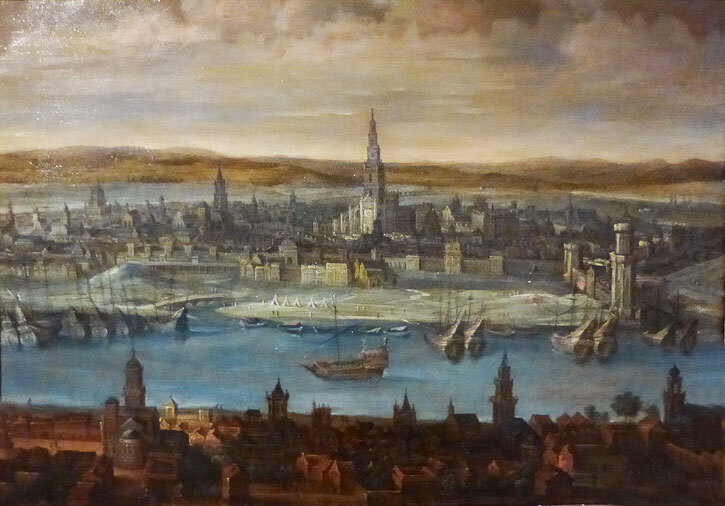 It had a population of around 200,000 people (compare that with around 60,000 for Seville in Spain and 50,000 for London), making it one of the largest cities in the entire world. If you include the inhabitants of the 9 smaller towns on the lakeside, the total population was 300,000. The entire Basin of Mexico in which Tenochtitlan lay - called Anahuac by the Aztecs - boasted a population of over 1.2 million people. 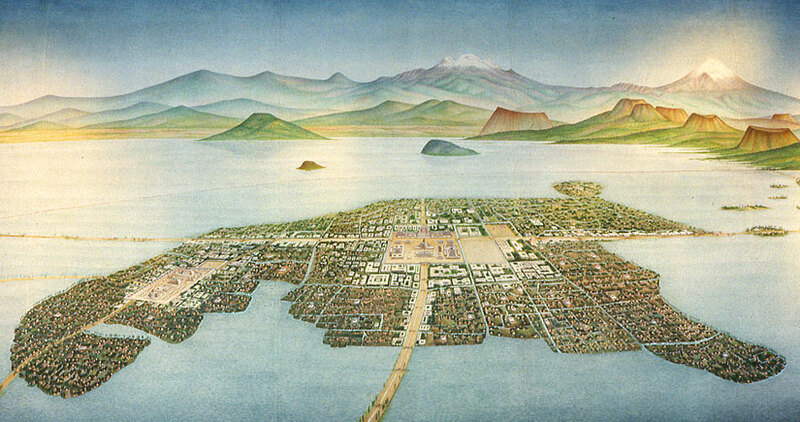 Tenochtitlan was a super productive ‘garden city’ built on an island, only around 4.5 square miles in size, that it shared with its ‘twin’ city-state Tlatelolco, a third of the size of Tenochtitlan. The island was connected to the mainland by causeways, one of which ran alongside a ‘dual carriageway’ aqueduct bringing fresh water to the city (most of Lake Texcoco was salty). The island was criss-crossed with canals, like arteries, alongside which was a network of chinampas - raised farming plots of land mistakenly called ‘floating gardens’ by the Spanish. 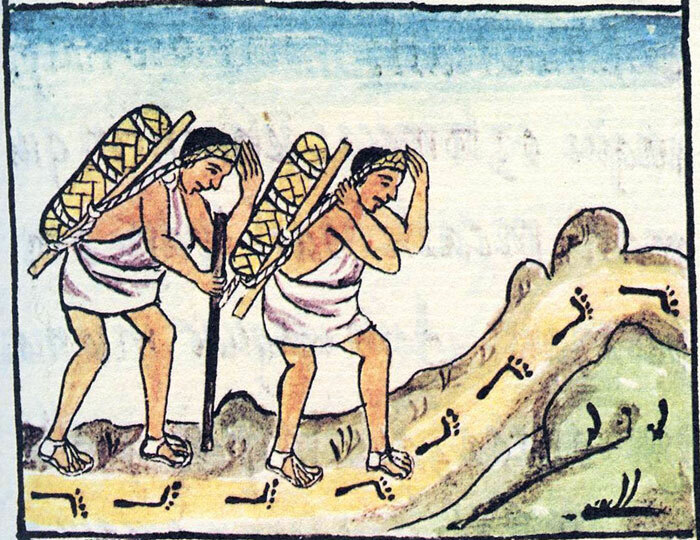 But the Aztecs remained at heart a nation of farmers: the year was split into two seasons - in the rainy season most men farmed the land, and in the dry season these same farmers swapped their digging sticks for spears and became soldiers in the army. 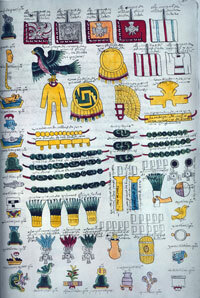 With regular deliveries from the tropical lowlands as well as the central valleys and plains, most Aztecs enjoyed a varied diet: at its heart were the staples of maize, beans and squash, supplemented by chillies, tomatoes, avocados, turkey, pineapples, amaranth, chia, cactus fruit, and of course chocolate and chewing gum! The lake too was a source of protein-rich fish, birds, turtles, and the superfood algae spirulina. 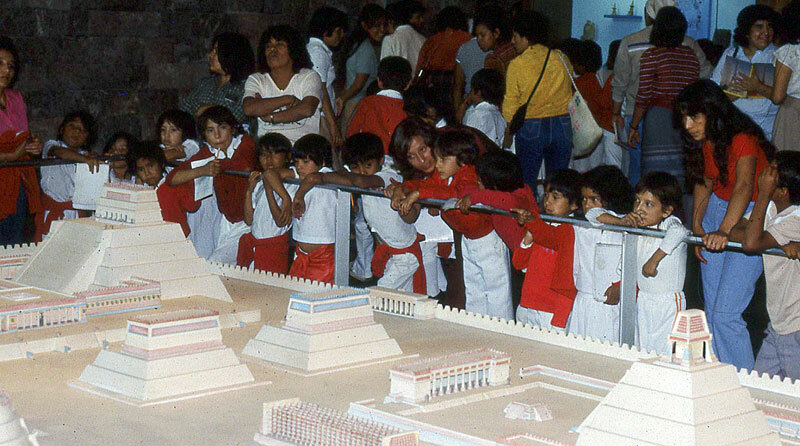 Using simple stone tools, the Aztecs built palaces, temple-pyramids, schools, ballcourts, store-houses - even a zoo; and the city was adorned with monumental stone sculptures of jaguars, eagles and other sacred creatures. At its centre, where the rich lived, was the sacred precinct, containing 78 temples and other buildings. By all accounts the city, boasting public toilets, clean water and steam baths, was spotless, swept clean every day by an army of 1,000 professional sweepers. 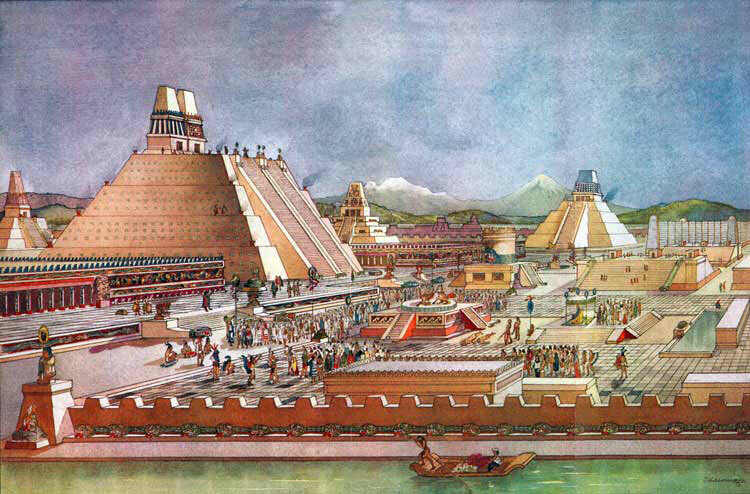 With its four great quarters, everything was laid out and designed on the basis of balance and harmony, the city centre (with its Great Temple or Templo Mayor) being a copy of the sacred Serpent Mountain Coatepetl, where the Sun (god) defeated the Moon (goddess) in Aztec myth, and the whole city was inspired by the ancient cities of Teotihuacan and Tula that the Aztecs greatly admired. The sumptuous wealth of the empire’s rulers was admired by all who saw it. When the German painter Albrecht Dürer saw an exhibition of Aztec treasures sent over to the Holy Roman Emperor by Hernán Cortés, leader of the conquistadors, in 1520, he wrote ‘All the days of my life I have seen nothing that rejoiced my heart so much as these things, for I saw amongst them wonderful works of art, and I marvelled at the subtle genius of men in foreign lands. Indeed I cannot express all that I thought there’. The Aztecs held that they were on a (divine) mission - both to dominate peoples all over the known world and to wage a cosmic struggle between the forces of light and dark on behalf of all. Each Aztec ruler - called tlatoani (‘Great Speaker’) in Nahuatl - was very much a warrior king (there were queens, but only in the very early years of Aztec history). Of the 9 rulers who expanded Aztec control to frontiers way beyond Tenochtitlan, most, but with some poor exceptions, were hugely successful - in particular Ahuitzotl, who ruled for 16 years from 1486 and grew the Aztec state into a true empire, reaching from Atlantic to Pacific coasts, and his nephew, the legendary Moctezuma II, who ruled from 1502 until 1520 when he died a hostage in Spanish hands. His reign saw the conquest of 44 new provinces, but crucially he failed to subdue the rival states of Tlaxcala and Huexotzingo, east of Tenochtitlan. The Aztec army could count, on the eve of the Spanish invasion, on approaching 300,000 men (most from subject provinces) - a giant force in those days, anywhere in the world. Most of these ‘soldiers’ were in fact porters, and the army was supported with foodstuffs and other necessities (including a ration of chocolate!) by a vast supply network operated by women. (Those provinces most distant from the capital did not have to pay tribute but provided soldiers for the army instead). 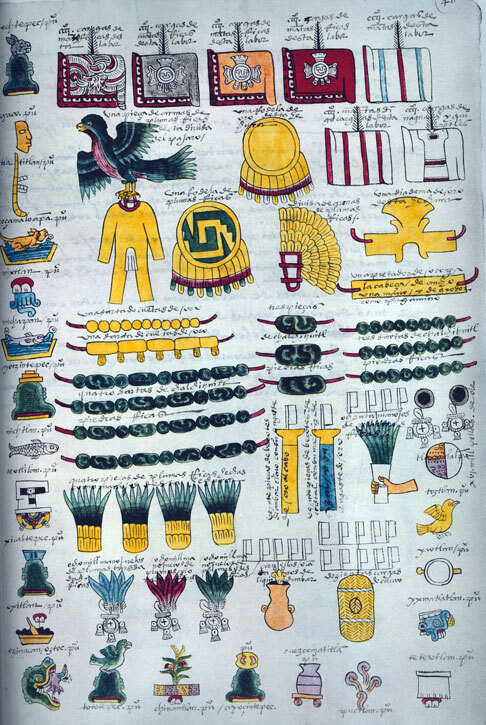 The Codex Mendoza, drawn up by Aztec scribes in the first few years of Spanish rule for the benefit of the Spanish king (though thanks to pirates, he never got to see it - it’s now in Oxford! ), clearly shows the symbols that represented conquest, both of towns and of individuals: a defeated altepetl was shown as a toppled and burning temple, and a captured warrior crouching before his Aztec victor who grasps the captive’s forelock (a lock of hair over the forehead). In both cases what is meant is not just the physical victory but the surrender of energy, soul and ‘essence’ of the loser in battle. Aztec warriors fought to capture rather than kill an enemy, and they brought back to Tenochtitlan not just their captives but wooden and stone statues of local gods, that were symbolically and publicly placed on display in the centre of the capital city. Far from being treated cruelly in defeat, enemy warriors were received in the homes of captors as honoured guests and given the best food and clothes in the house - until such time as the festive calendar called for them to be sacrificed to the gods, when they would be accompanied by their captors up the steps of the temple-pyramids... Not surprisingly, ordinary Aztec warriors could move steadily up the ranks by the tally of enemies captured, and so gain prestige and status, leading even to the ranks of Eagle or Jaguar Knights. 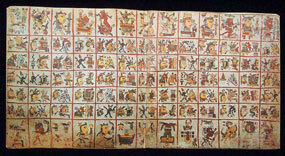 The capturing of enemy warriors was ritualized in Aztec ‘flowery wars’, resembling war games for warrior training or international ‘matches’ held on agreed dates between rival states: no territory or spoils were taken, only captives for later sacrifice. 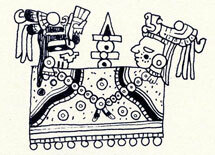 It has been suggested the Aztecs used ‘flowery wars’ as an excuse to explain later to the invading Spanish why they had had no success in defeating the Tlaxcalans. Though astute at forming strategic marriage alliances and spreading wealth among key loyal nobles, Aztec rulers succeeded more in creating an empire of trade and tribute than one that was politically united. 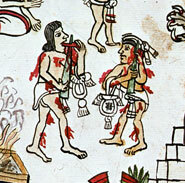 Whilst it’s true the Aztecs basically left conquered peoples alone to rule themselves - so long as they paid their taxes! - the tribute demands were heavy. Nearly 400 towns throughout the empire coughed up huge amounts of material every year - from 16,000 rubber balls to 240,000 pieces of cloth. Naturally enough, provincial towns DID rebel on occasion by withholding tribute - though the ruler responded with military force. This model of empire was different to European examples and in general proved highly successful: by avoiding the need for permanent military occupation, the system freed up soldiers to engage in further expeditions of conquest; but its success depended crucially on a strong ruler/king/emperor at the centre. The richest tribute stream, without doubt, was to the East, linking Tenochtitlan to the fertile cacao-growing distant lowlands of Xoconusco. 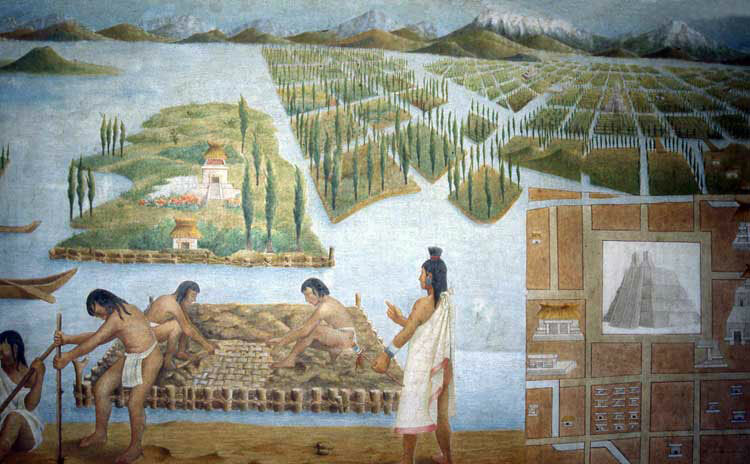 The main foodstuffs came either from the chinampas of Tenochtitlan or the immediate area near the Basin of Mexico. Supplies were only seriously at risk from the region being vulnerable to (quite frequent) natural disasters - locust plagues, floods, hail and snowstorms, drought and severe famines. 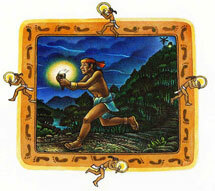 Communications were based on a highly efficient system of couriers running in relays across the country - similar to that of the Inca empire in South America. Reports suggest these messenger teams could cover anything from 200 to 350 miles in a single day. 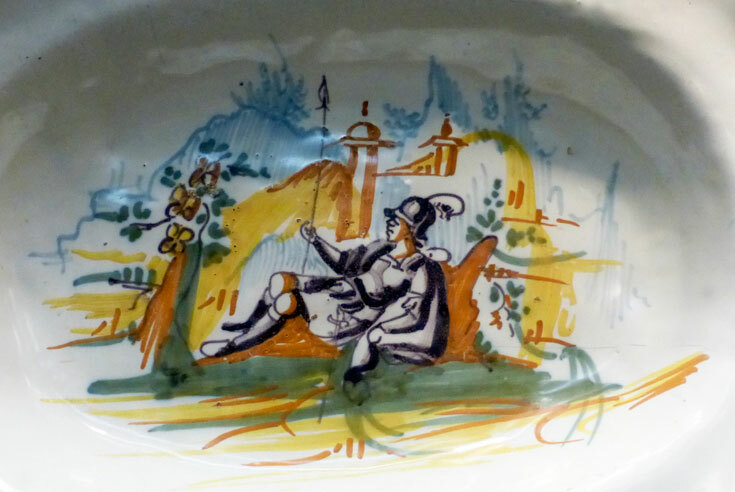 An even more important role was played by the pochteca - long-distance merchants who doubled both as military spies for the emperor and as administrators of the tribute networks. 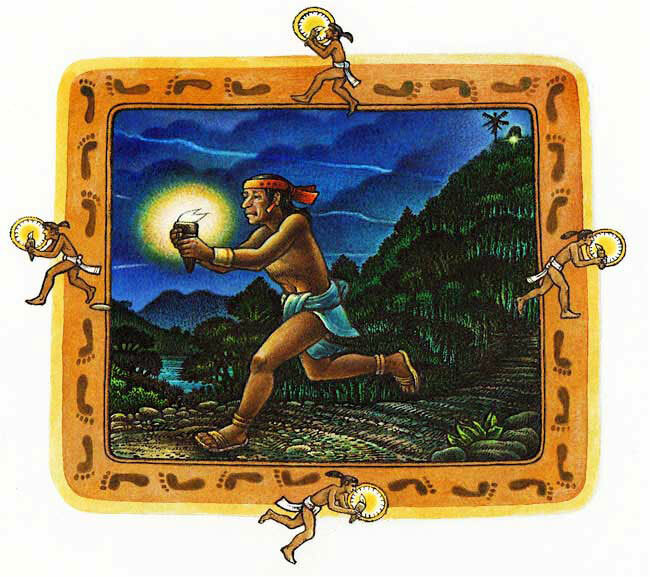 They were rewarded with noble status, and famously arrived back at Tenochtitlan at night to avoid displaying the wealth they had brought back with them on lengthy expeditions. Powerful as the pochteca were, with their own contingents of porters and special privileges, their entire operations were subject to the dictates of the sacred calendar. Even the day of their departure from the capital depended on the choice of a favourable day, taken from a tonalamatl or sacred Book of Days or Fates, read by a trained soothsayer. 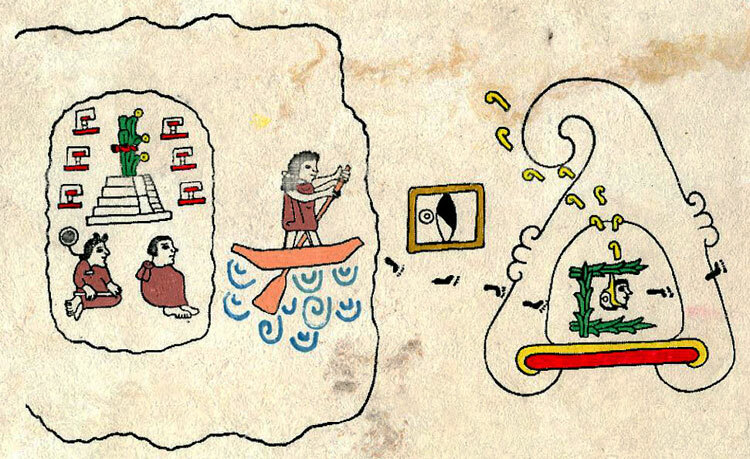 The daily lives of all Aztec people - from naming a baby to finding a good day to travel, wed, fight a battle, plant seeds, and much more... - were strictly ruled by these sacred, screenfold, books, with their multiple cycles of time. 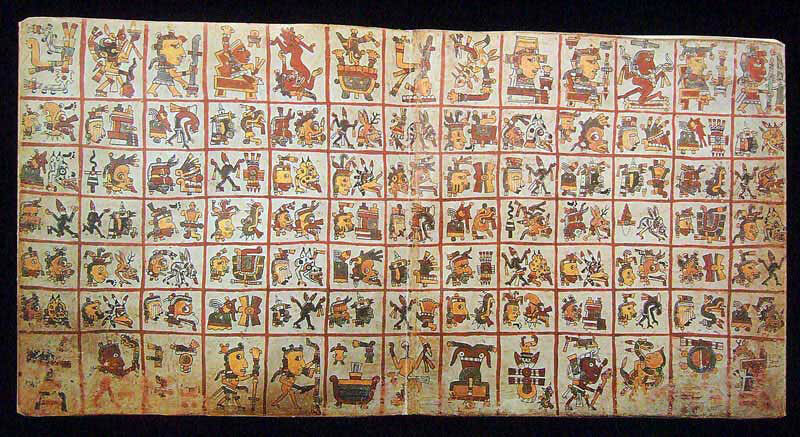 The two main calendars of the Aztecs - 365-day sun calendar and 260-day moon calendar - only coincided once every 52 years, a most special age and length of time throughout Mesoamerica, marked by the biggest ceremony in the Aztec world, when a New Fire was lit to welcome a new cycle. Much larger cycles of time based on multiples of 52 - called ‘Suns’ by the Aztecs - were ages of creation, each ruled by a different god. According to Aztec belief, they were (and we are today) living in the fifth and last Sun, in danger of destruction if the balance of cosmic forces - in particular between light and dark, life and death... - should be lost. Life and death go round and round in an eternal cycle of giving-and-taking (‘We eat from the earth, then the earth eats from us’). Constantly in fear of losing this balance, the Aztecs were a highly superstitious people, driven by the need to pay the gods back for having sacrificed themselves at the beginning of the fifth Sun. Their term for ‘human sacrifice’ was precisely ‘payback’, and it involved offering our most precious liquid - blood - as a gift to the gods. 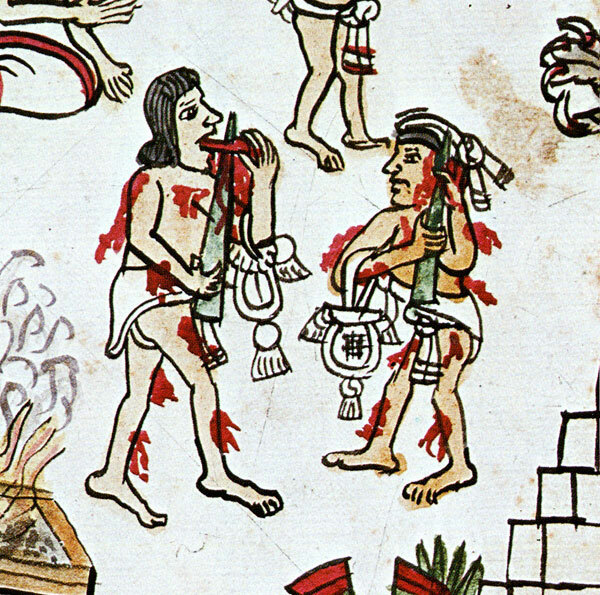 Most people are unaware that the Aztecs performed far more self-sacrifice (piercing parts of the body to release blood onto the earth) than human sacrifices. The two most ‘blood-thirsty’ gods were the Sun and the Earth; whilst self-sacrifice was a daily duty, human sacrifices - which often only involved a single victim, who imitated and was offered to the deity of that ‘month’ - only took place every 20 days, to link with the calendar round, and involved public ceremonies in open plazas, accompanied by drumming, dancing and chanting: performances to the gods in which all took part, generally late in the day with dramatic natural lighting from the setting sun and fires burning at the top of the Templo Mayor, a sacred space at the centre of the four directions. Strong believers in re-birth, where you went in the afterlife depended not on how you lived your life but on how you died: there were 13 heavens and 9 underworlds, all at different locations on a vertical axis (the fifth dimension); one of the highest was reserved for those who died on the sacrificial stone or in battle. 1492, the year Columbus ‘discovered’ the Caribbean, was a momentous year in Spain’s history and destiny: by coincidence, after nearly 8 centuries of conflict between Islam and Christianity, it was in 1492 that Castile (Spain’s biggest, most successful and most dynamic kingdom) finally managed to throw out the Moors from Granada (the famous Reconquista), and could think of rebuilding Spain’s damaged trade links with the rest of the world. A once thriving trade with the Far East, that had previously provided a rich source of spices, had, like the country itself, been badly damaged by wars and setbacks, such as the capture of key Italian trading ports on the Black Sea by the Ottoman Empire. Europe’s appetite for spices had become insatiable, and was one of the main motives for Columbus heading out to find a new route to the (East) Indies. Castile yearned to reach out again to cities and markets, old and new: one of the topics that most fired the imagination of Cortés’s band of adventurers - and about which they wrote extensively in their diaries - was the Great Market at Tlatelolco. Spain and Portugal were at the time leading (and rival) naval powers, battling to capture new territories and to defend their Christianity against other religious forces. Just one year after 1492, Pope Alexander VI had granted both countries the ‘privilege’ of taking possession of the New World, and both countries tried to justify their conquests by the need to end the ‘barbarity’ of native peoples and to ‘save’ their souls. This fanaticism, and addiction to ‘war with a religious justification’, born out of Spain’s long struggle against Islam, was to fuel the Spanish mission to eradicate human sacrifice - and so, conveniently, to justify their cruel treatment of the peoples they conquered. And of course, the more lands they took, the richer the King became: Carlos I of Spain demanded a ‘Royal Fifth’ from all the spoils of conquest, and silver quickly became the currency with which Spain financed costly new campaigns of war and exploration, supported by huge, expensive bureaucracies. Unfortunately for Spain, the Caribbean islands proved a severe disappointment: no gold, no splendid cities, and a rebellious native population that virtually collapsed in 20 years from several hundred thousand to close to zero. No wonder that (imported) slaves were to prove invaluable, and that Spain should turn her attention to the mainland, rumoured to be wealthy beyond dreams, as a natural extension of her colonisation of the Indies. Backed by strong ideas, a hardy individualism, missionary zeal and ideals of nobility, and having cut her teeth in North Africa, the Canary Islands and then the Caribbean, Spain had built up extensive experience in military, governmental and trading affairs, based on a tried and tested feudal model. 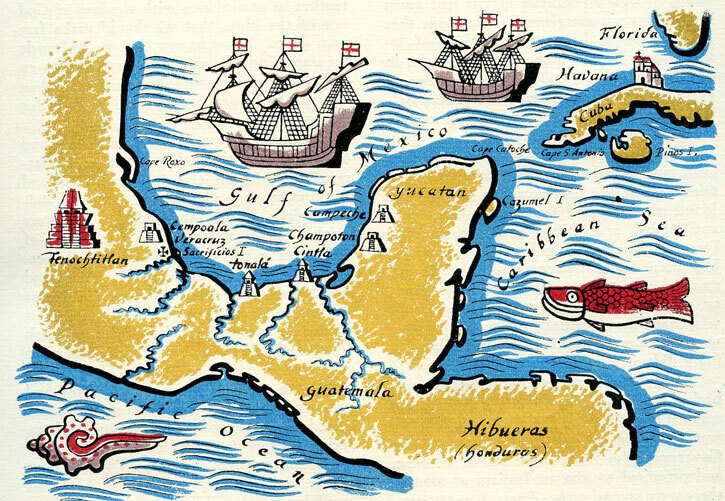 A couple of smaller expeditions preceded Cortés: the first sailed under Francisco Hernández de Córdoba from Cuba to the Yucatán peninsula in 1517, the second, led by Juan de Grijalva, explored part of the Atlantic coast of Mexico in 1518 - it was this one that gave Aztec scouts at Veracruz their first sight of the newcomers, whose ships were described as ‘towers or small mountains floating on the sea’. Much has been made of the idea that the Aztecs had witnessed several strange omens in the months and years prior to the Conquest, paralysing them with fear for their impending doom. In fact it turns out that these same omens come from European texts which the writers of the Florentine Codex (where the omens are spelt out) would have had access to in the Franciscan College that they attended. 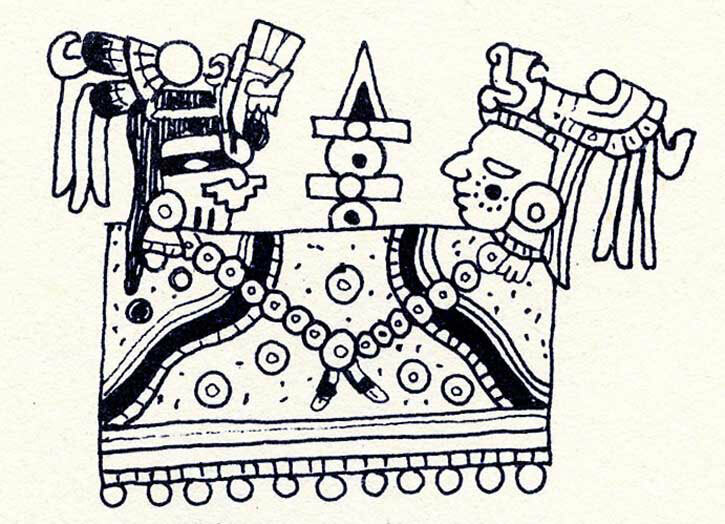 And whilst it’s possible the Aztecs mistook Cortés initially for the returning god Quetzalcóatl (there was a coincidence of dates) they quickly realised he was anything but. We know now that these tales were all ‘spin’ added later by the Spanish to spice up the story of their conquest of Mexico. 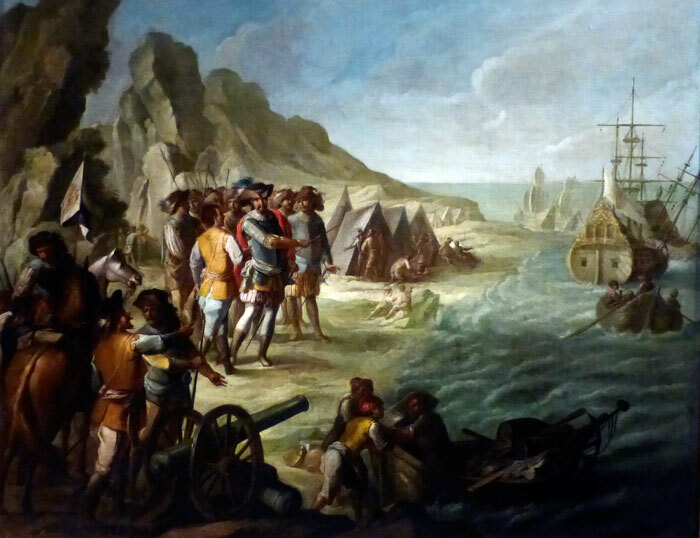 Despite last-minute attempts by the governor of Cuba, Diego Velázquez, to stop him sailing - afraid he would disobey the orders simply to explore, NOT to invade - Cortés set sail hurriedly on February 10th 1519 with 11 ships, 450 soldiers, 14 cannon, 16 horses and a few ferocious mastiffs (large attack dogs trained to kill). Not only were the natives in awe at the ships, they had never seen before horses, guns or huge, fierce, armour-plated hounds, their saliva (a sign of anger) ‘dripping from their jaws’. These creatures were in turn led by men, most of whom were commoners from Extremadura, Spain’s poorest province, in the kingdom of Castile - tough hombres who had grown up as free men on a diet of one meal a day and the motto ‘God, Gold and Glory’. The force landed unopposed (it was impossible for the empire to guard hundreds of miles of coastline) at Cozumel and sent out a ship to search for two known Spanish survivors of a shipwreck from 1511. The Aztec contingent withdrew, leaving the field wide open to others to approach the Spanish: barely three days later the Totonacs (see pic 20) came forward - giving Cortés the first hint of local resentment of the Aztecs. And their enemies were powerful: the Tlaxcalan kingdom to the east (pic 20) and the Tarascan empire (home to a million people) to the west had never been defeated by the Mexica. But Cortés had to watch his back as well: some of his men were unhappy with him for disobeying his instructions and asked to return to Cuba. On this occasion, Cortés shrewdly won them over with bribes. Later he acted more ruthlessly, hanging the ‘conspirators’ and scuttling the ships: now, literally, there was no going back. Then, in a clever legalistic move designed to bypass his boss in Cuba and to act directly in the name of the king, he founded the town of Veracruz, symbolically placing it, its City Council - and his force - under the Spanish crown. For the time being, he was ‘legal’. 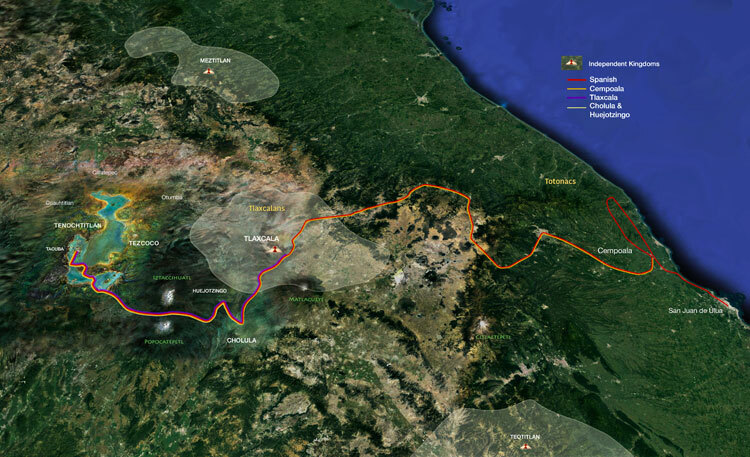 • Pic 20: map created for Mexicolore by Tomás Filsinger.